As I browse through Maria & Kata Jewelry Creations, I am blown away by how beautiful AND affordable her jewelry is! My personal favourites are the unique earrings especially the ones made with geodes. This Dazzling Black Geodes earring and necklace set is stunning! Maria & Kata Jewelry Creations handcrafted jewelry are quality made and inspired by nature, vintage pieces shown in magazines or by people the designer, Maria, meets in her life including her young daughter. Check out all the beautiful earrings, pendants and pretty crocheted items at Maria & Kata Jewelry Creations. You can also find them on Facebook. I design from chic to modern to vintage to unique pieces. My inspiration comes from nature, vintage pieces found in magazines or by seeing someone pass me by in the street wearing something unique. My daughter is inspired by her unique imagination. I offer hand crafted earrings and jewelry using different materials and stones. I also offer crochet items all handmade by my mom-in-law. My typical customer are WAHMs or ladies that love to be stylish, but without spending so much money for it. I started in 2007, but I really became serious in 2010. What sets your business apart from others in your niche? I have my own style. I like to see what’s out there, but without copying anyone else. I have my own identity and my customers know that. 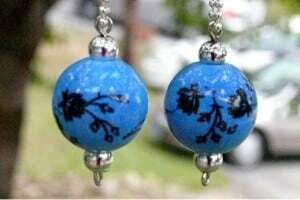 My most popular is “The Original Blue Moon” earrings. My daughter inspires me everyday. She’s ten, but she has a creative mind. Many of the earrings featured are her inspiration. I’m also inspired by nature’s beauty given to us by our Creator. I see my business moving forward getting better; offering new products not just for women, but for men too. Becoming self-employed. I ship within the US now, but I can ship to other countries. I purchased jewelry from MariaKata and I can tell you the photos don’t do it justice. They are beautiful and unique in real life!! Highly recommend her! Thank you Stacie for posting my feature. I was thrilled and so was my daughter Katarina. Thanks Mary and Breville for you lovely comments! 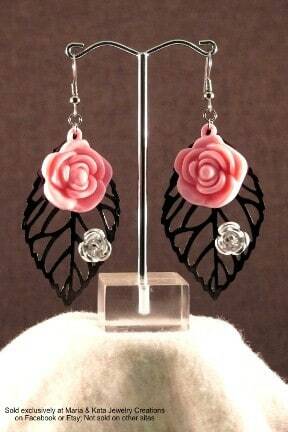 I checked their site and their earrings are lovely.